This interview was originally published in Korpil.net on November, 24th, 2010. Pablo Hidalgo, archetype of the Star Wars fan has kindly answered an interview. He is currently an Internet Content Developer for StarWars. Born in Chile and raised in Canada, he created one of the most complete fan pages ever, the Star Wars Index, now deactivated. He had the fortune to publish cartoons in official magazines, such as the Star Wars Adventure Journal, a periodical by West End Games, creators of the first ever Star Wars role playing game. 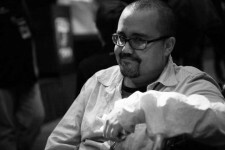 He later moved to San Francisco when hired by Lucasfilm, and was instrumental in the creation of StarWars.com as the main source of information for fans. He co-autherd Star Wars: Chronicles and the second edition of the Star Wars: Encyclopaedia, both along Steve Sansweet. After publishing G.I. Joe vs Cobra: The Essential Guide on his own, there are several books he has authored or co-authored that have recently been published or that will be in the near future. Thanks for accepting this interview! 1. Could you tell us something about you? Where are you from? I was born in Santiago, Chile, and raised in Winnipeg, Manitoba, Canada. I moved down to Northern California over 10 years ago to take this job with Lucasfilm. 2. When and how did you became a Star Wars fan? I’m part of the first generation of Star Wars fans. It was pretty much a cultural requirement to be into Star Wars if you were a boy in the late ’70s, early ’80s. When Star Wars faded in the late ’80s, I moved onto other things, but the release of the Star Wars Sourcebook brought me back. That period from 1987-1990 when West End Games was the sole publisher of Star Wars lore is my favorite period, because it felt like Star Wars was your own personal universe to explore. Star Wars was so rare back then, you treasured every little scrap of it. There was a giddy thrill in getting your issue of Lucasfilm Fan Club Magazine in the mail, and visiting the hobby store and seeing a new book or new box of miniatures. 3. Before you joined Lucasfilm, you were a successful fan content creator, can you tell us about your projects, such as the Star Wars Index? The Index also stemmed from my love of the first Star Wars RPG. I gamemastered Star Wars for years, and I’m the kind of GM who really does a deep dive into research. I made it a point to learn as much of the entire Star WarsExpanded Universe as I could, and I started cataloging it in a massive document. It became a Star Warsencyclopedia before there was ever a published one. When I first got online in 1997, I put pieces of it on a personal website as the Index to see what people thought of it. That resulted in several online friendships with Star Warsexperts that continue to this day, and many of them are now published authors. Another pre-Lucasfilm web piece that I did was a compilation of all the “Wilhelm screams” I could find on home video. This was back before the scream phenomenon was well known. I put it on theforce.net in 1999, and pretty much forgot about it. Then a few years back, someone put it on Youtube, and now it’s got over 2.6 million views! 4. How did you become involved with Lucasfilm? It started with West End Games. Back in 1993, they put out an open call for fan submissions for a planned periodical, the Star Wars Adventure Journal. I submitted something, I forget exactly what, but Lucasfilm policy had changed between the call and the first issue. Now, WEG would only take previously published authors, and would not accept unsolicited proposals. WEG sent me a form letter telling me they could not accept the submission. But the editor, Peter Schweighofer, wrote me a personalized cover letter explaining the situation. So I wrote back a fakeform letter thanking them for the personalized letter. It made some sort of impression because it opened up continued correspondence. There was something funny enough about what I wrote that WEG decided to accept me not as a writer, but as a cartoonist. So I started doing silly little single-panel comics in the Adventure Journal. With that, I was published, and that opened the way for me continuing to write for the roleplaying game. In my interactions with WEG at various conventions, they found out about my encyclopedia (which was not online at the time), and my knowledge of the EU. They then pointed me toward Steve Sansweet, who was writing The Star Wars Encyclopedia. He asked if I could look it over for accuracy. I did, and sent him 80 pages of corrections and clarifications. In 1999, Lucasfilm posted a position for an Internet Content Developer on their website. I applied for the job, and got it. I’m guessing my track record helped. 5. What can you say to other fans who wish to be involved in a more official way with Star Wars? Cultivate your professional skills, and not just your knowledge of Star Wars lore. Knowing what I did about the universe wouldn’t have helped at all if I wasn’t able to communicate clearly with editors. If you want to be a writer, or a filmmaker, or a designer, study not just creative material but learn about the business, so you’re able to discuss things in a professional language other than Star Wars. 6. Some of your first official projects were the humor strips for Star Wars: Adventure Journal; what have you learned since then, that helped you create the StarWars.com webcomics? A willingness to spread the work. There’s too many stories I want to tell, and not enough time to do it, so you have to partner with great artists, like Tom Hodges and Grant Gould in the latest web comics, to get it done. 7. Star Wars Chronicles was your first title as a co-author, what were your responsibilities? For the Prequels, I really handled most of the Episode III material. I was lucky enough to have an unprecedented ringside seat to the creation of that movie. Being on set each day, and regularly visiting ILM during the production, I had the knowledge necessary to write those sections already in my head. 8. 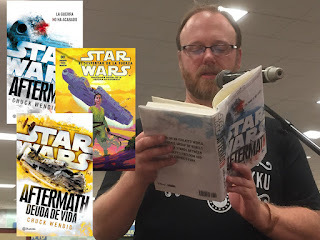 Do you consider your involvement as co-author, also with Steve Sansweet, of the second Star Wars Encyclopedia, a sign of the passing of the torch from one generation of Star Wars reference writers to a younger one? Oh, it’s not generational at all. I think it’s more indicative of how vast the Star Wars galaxy has become. There’s no one author who can act as an absolute authority. It’s a team effort. A future Encyclopedia would probably need evenmore authors than worked on the last one. 9. Do you have other non-Star Wars related projects? I just wrapped up Transformers Vault: The Complete Transformers Universe which is due out next year from Abrams. 10. Whose continuity is more of a hassle when you write about it? Star Wars, G.I. Joe or Transformers? Star Wars is so different than the other two. Joe and Transformers are totally willing to reboot continuity with each new expression of the brand, and I’d argue that it ends up being stronger because of it, because they can take the best of what works. You don’t get into this weird situation where you’re asked to accept that Luke has crashed his X-wing hundreds of time between Episodes IV and V, or that Leia has been taken captive over 100 times. 11. 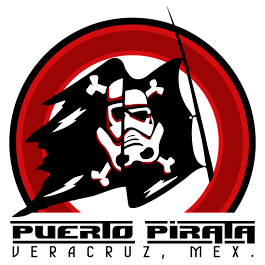 During your time at that division, what were the greatest challenges for a project such as StarWars.com? The greatest ongoing challenge is connecting to an audience that is always changing. The web has changed so much in 10 years that the StarWars.com reader is a wider variety of people now than it was during the making of the prequels. 12. The @starwars twitter account is enormously popular. How can social networks improve the relationship between Star Wars creators and the fandom? Credit for the management of our twitter presence really goes to Bonnie Burton, one of our senior editor and that’s usually her on the account. It has allowed for direct interaction with fans in a fun, manageable way, as well as an eye into the creativity and love that exists for Star Wars on the Internet. My favorite is when a Star Wars meme spontaneously appears on Twitter and explodes in popularity. 13. Are there any plans to expand StarWars.com’s content into other languages? Not that I’m pitching myself as a possible Spanish contributor. There are no solid plans that I know of, but it’s been something that has been talked about many times. To quote Lando, “we’re a small operation,” so that tends to limit our ability to do things like that. We did do a Japanese version of the site a while back, which was only made possible by a professional partner able to take on the work. 14. How was your Star Wars: Head to Head book conceived? Who is the target audience? The concept came fully formed by the time I entered the picture, so I’m not sure who came up with it — probably a combination of the editors here at Lucas Books, becker&mayer! and Scholastic, Inc. The target was very much kids, and I’ve got a lot of great feedback from children, usually around 8 to 12 years old, about the book. And their parents, too. 15. Star Wars: Year By Year seems to be a great addition to reference books. How did you and the rest of the authors distributed the work? Is there like a friendly competition among reference authors? It was pretty clear cut delineation. Ryder Windham had the early chapters, through to the completion of the original trilogy. Dan Wallace had the middle years. I had the prequels and beyond. Gus Lopez sprinkled fascinating collectibles stories throughout the entire book. And we all read each other’s work to see if there were opportunities to reinforce each other’s stories, as well as to fact-check things. 16. The announcement of the Star Wars: The Essential Reader’s Companion sounds like a great addition for those who don’t know how to delve into the Star Wars Expanded Universe. What can you tell us about this book? It’s still coming together. In a nutshell, it’s basically Star Wars: The Comics Companion but for prose fiction. A high-level summary of all the novels, short stories and young reader novels in a chronological reading order, with what I hope are interesting footnotes that track the evolution of the expanded universe. A big bonus is that there will be all new art to depict characters and events that have yet to be depicted. 17. The addition of new illustrations for previously non pictured characters is simply great, do you have a list of the artist who will be collaborating with this project? Not yet. I would expect a lot of the artists who have contributed to Essential Guides in the past to be onboard, joined by new ones as well. 18. What kind of novel would you like to write as a full-blown project? I’d love to do a heist or a mystery. I like smaller stories without huge, galaxy-shaking consequences. So far, I’ve only ever written short stories, but I’d love to do long form fiction. I’m really interested in seeing what Transformers is doing with their publishing. I have some ideas for that universe too. 19. Do you speak Spanish? Have you ever been in Mexico? A little bit of Spanish. I understand more than I feel comfortable speaking. And, yes, I’ve visited Rosarito Beach on vacation. 20. And now, fan questions. Lord Tuetanus from Durango asks, what is the editorial process for creation of new content in Lucasfilm? Continuity, magical word, how is it controlled? If you’re referring to published, expanded universe content, then it’s really up to the editors in our Licensing group to work with the publishing partners and the authors to develop a story, and the editors and Leland Chee review the story for any new continuity, potential conflicts, or opportunities to connect to other stories. I have no formal involvement in this, but I am an occasional guest who is allowed to sit in on story conferences and offer input from time to time. If you’re referring to the stories that come out television production, that comes out collaboration from George Lucas, Dave Filoni, and a team of writers during a story conference. They have access to all the Expanded Universe reference books during development, and will occasionally send queries to Leland and myself to see if there’s opportunity to connect with the EU. But aside from that, I have no involvement on the story side of The Clone Wars. 21. Marcelo asks, knowing you were in the filming sets, how is George Lucas during filming? What is his behavior and his relationship with the rest of the technical team? Tell us about your personal experience, what is working for Lucasfilm like? How is the work environment, discipline, confidentiality policies, etc.? Thanks, Marcello. That’s a lot of stuff to go through! I’ll just be brief and say that the experience was fantastic, and although the schedule of production was very tight, and the work went really fast, the attitude was focused, but not tense. By the time Episode III was in production, much of the team had been working together since the Young Indy days, and I would say this led to confidence that every challenge could be met. As far as confidentiality, I was grateful with the amount of trust I was given to cover the making of Episode III every day, and yet not give away all the surprises. There was never any lecture or formal list about what could or could not be shown. 22. Freddy Aguilar from Guadalajara would like first to congratulate you and express his admiration and gratitude for your contributions to Star Wars. What do you think about Star Wars: The Clone Wars not following the continuity established previously in books and comics for the timeline between Episodes II and III? Could all those events that are being unfolded ever be folded into a coherent timeline? Some time ago you started a podcast related to The Clone Wars, will there ever be new episodes? Good question, Freddy. As for the podcast, that was done for the series launch, and eventually evolved into something that supported the Clone Wars Republic Heroes video game. There’s no plan for future installments. As far as continuity, I see The Clone Wars as being no different than the arrival of the prequels in 1999. We fans knew that those movies would be a representation of the true Star Wars universe as imagined by George Lucas, and in some cases, it would not perfectly match the stories told by Expanded Universe authors. So, we had to unlearn all we had learned about the Mon Calamari being discovered by the Empire, about Boba Fett being Jaster Mereel, and about the Republic having a standing military. I think with each episode, we start to get a better understanding about what the real Star Wars universe is like, and it won’t be until whenever the series ends that we’ll be able to accurately decide how the older EU material fits into the big picture.